Tetovo (Macedonian: Тетово, [ˈtɛtɔvɔ]; Albanian: Tetovë/Tetova; Turkish: Kalkandelen) is a city in the northwestern part of Macedonia, built on the foothills of Šar Mountain and divided by the Pena River. The municipality of Tetovo covers an area of 1,080 km2 (417 sq mi) at 468 meters (1,535 ft) above sea level, with a population of 52,915. The city of Tetovo is the seat of Tetovo Municipality. In antiquity, Tetovo was a Greco-Roman fortress-town in eastern Illyria, called Oaeneon(Οαίνεον), in Latin Oaeneum, located on the pass between mount Scardos (now Šar) and river Artatos (later called Oracha, now Pena), a tributary to river Axios (Αξιός) in Greek, or Bardar in Slavic. This was a territory where the Illyrian tribe Penestae lived, and it included the fortress-towns Draudacum, Uskana, Divra and Styberra in northern Pelagonia. Various archaeological findings suggest Tetovo was first inhabited thousands of years ago. Near Tetovo/Oaeneon, a Greek sword of the Mycenean era and a bronze statuette of the 6th c. BCE have been found, discerning a Greek presence since the 2nd mill. BCE. Subsequently, Oaeneon was ruled by many ethnic groups; the Illyrian Genthius of the Labeatae, by King Perseus of Macedonia, by the Romans, by the Byzantines, by the Slavs, by the Bulgarians, and it was invaded by the Avars. In the 15th c. AD, Oaeneum came under Ottoman rule for aboutfive centuries. 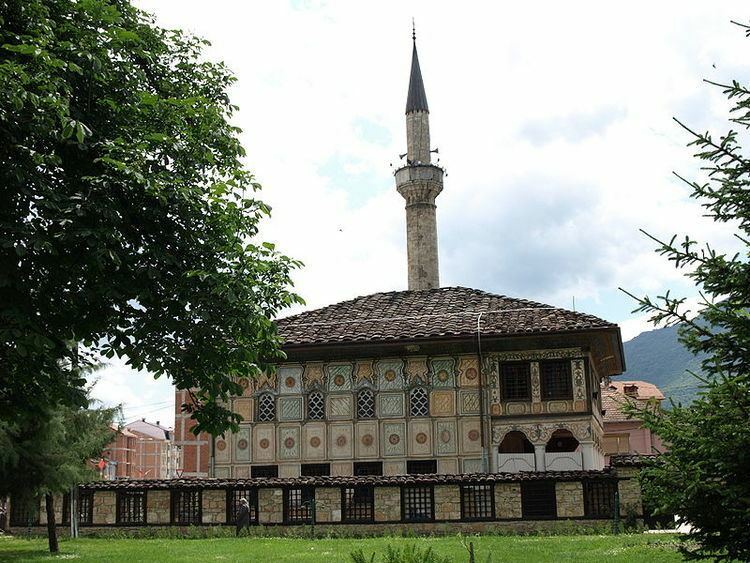 Then, the city's population was forced to convert to Islam and many Ottoman-style structures were built, such as the Šarena Džamija and the Arabati Baba Teḱe, which still stand as two of Macedonia's most significant landmarks of its Ottoman period. 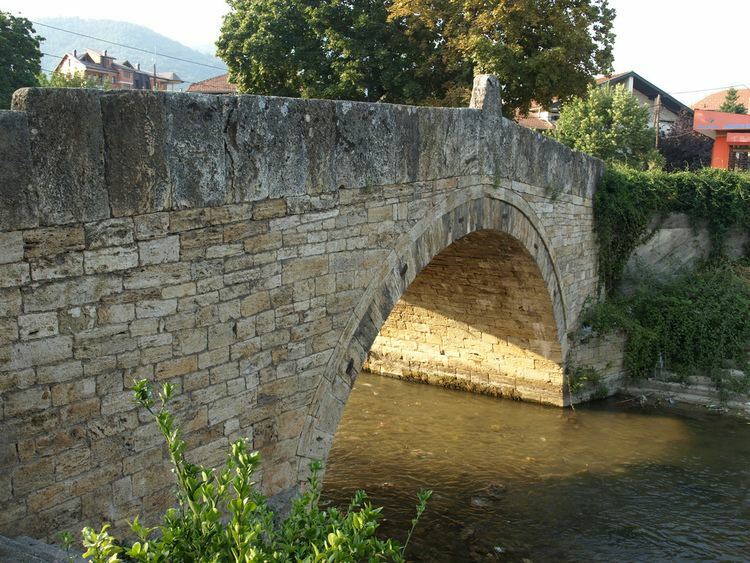 During this period, the town belonged to the Vilayet of Kosovo, became a firearm and cannon foundry, and was renamed Kalkandelen (meaning Shield Penetrator); as a result, the town attracted many workers (Albanians, Bulgarians, Serbs, and Roma) and grew to a city. Following the World Wars, Tetovo became a part of Yugoslavia and, later, the Republic of Macedonia. Just outside Tetovo is the South East European University, Macedonia’s third largest university after Skopje and Bitola. Tetovo is also home to the State University of Tetovo. There have been archaeological discoveries near Tetovo which date back to the Bronze Age (2200-1200BC). In the Republic of Macedonia, the oldest artefact, a Mycenae sword from the Bronze Age, was found outside Tetovo. It is now on show in the Museum of Macedonia in Skopje. After the strong Avaric-Slavic incursions in the late 6th century AD, all the fortresses were abandoned but not entirely demolished. At the end of the 10th century, the region became part of the First Bulgarian Empire under Tsar Samuil. After several decades of almost incessant fighting, the area came under Byzantine rule again in 1018. By the 19th century, when the population of Kalkandelen began to increase with settlement from the surrounding villages, the French traveler Ami Boue noted that the population had reached about 4,500 people, which are Bulgarians and Albanians. The total population of the Pashalik of Kalkandelen (Tetovo) is 30,000-40,000 and consists of Bulgarians who are Orthodox and of Albanian who are Muslims. According to British diplomat and traveller Aubrey Herbert, and English taveller Austen Henry Layard, the majority of the inhabitants of Kalkandelen were Albanian. Turkish sources cite that three-quarters of the population of Kalkandelen during the Ottoman period were Albanian. According to the statistics of the Bulgarian ethnographer Vasil Kanchov in 1900 the population of Kalkandelen consists of 8,500 Bulgarians, 9,000 Turks, 500 Arnauts and 1,200 Romani. During the breakup of the Ottoman Empire, Tetovo came under Albanian control by forces led by Hasan Prishtina. From a period between 1913 and 1915, during the Balkan war, the Serbian Army captured Tetovo and the entire region of what is today Macedonia became known as "South Serbia" as part of the Kingdom of Serbia. The town became part of the Socialist Republic of Macedonia. The early years of Socialist Yugoslavia were turbulent for Tetovo’s Albanian population. Many were subjected to repression, causing many to immigrate. Those who remained demonstrated periodically but violently against the communist regime, notably in the Yucel Incident of 1957 and the Kalkandelen Incident of 1968. Many of these protest were led by Mehmet Gega, a notable Albanian rights activist who was sentenced to ten years in prison. In the 1968 demonstrations, The Tetovar Albanians demanded for the attachment of the Albanian areas of Socialist Republic of Macedonia to Kosovo and their joint reconstitution as a seventh republic of Yugoslavia. The authorities rejected this demand and instead authorised the revision of syllabuses and textbooks in order to curb what it called ‘‘The penetration of Albanian nationalistic, irredentist and counter-revolutionary tendencies through printed textbooks and other literature.’’ In 1974, a new federal constitution was ratified which eased the tension of the local Albanians. The government of Yugoslavia viewed these demonstrations as the first stage in an Albanian plot aimed at eventually separating these areas, and joining them with neighboring Albania. SR Macedonia imposed harder prison sentences than the authorities in Kosovo. In economic terms Tetovo is one of the most developing cities in Macedonia with some multinational companies (Ecolog International, SUVAFIX Renova, Zikoprom) being located in this town. Despite the interest of private companies in Tetovo, the city is neglected by the government. Tetovo suffers from urban sprawl. Due to the lack of government regulations, the city has no system for building permits, and many houses and buildings have been built unsafely and randomly along footpaths, roads and in parks. Air pollution levels are among the highest in Europe. Tetovo is one of the educational centres in Macedonia hosting two universities South East European University (Public Private Non-profitable) and State University of Tetovo (Public University). The prior one has educational leadership in the region, whereat the Bologna Process is applicable since its establishment, has the best campus in the region of South East Europe and is trend with international developments in education. More than 20,000 students get their education and degrees in Tetovo. In addition, Tetovo is a centre of ethnic Albanian politics. Most Albanian political parties on Macedonia (Democratic Party of Albanians (DPA), Democratic Union for Integration (DUI) and the Party for Democratic Prosperity (PDP)) have their main seats there. Tetovo has one of the highest crime rates in the Republic of Macedonia, second only to the much larger capital Skopje. The city was home to 1,229 criminal acts in the first half of 2009. 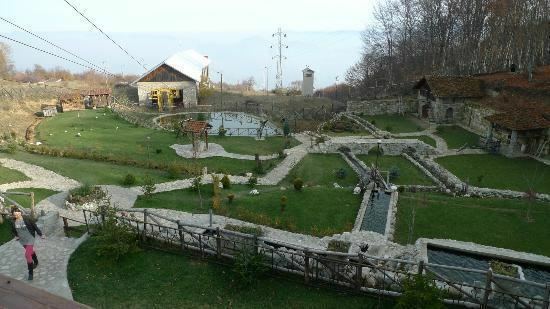 The cuisines in Tetovo have a unique taste and flavour due to the local agricultural products used to make the cuisines. In Macedonia, Tetovo Kashkaval cheese is the most popular as it is made naturally from sheep's milk from the Šar Mountains. During the Kingdom of Yugoslavia, apples from Tetovo were popular in Belgrade and were known as Tetovo Jabuka. The most popular sport in Tetovo is Football. Tetovo is represented by four clubs of which three play in the Macedonian First League. FK Shkëndija, supported by the majority of the Albanians living in Tetovo. FK Renova, mainly supported by Albanians but has significant Macedonian support, and are based in Džepčište. FK Teteks is the team supported by the Macedonians living in Tetovo. FK Ljuboten is another football club based in Tetovo and is the oldest football club in Macedonia.